Rob brought this home today and I nearly peed my pants in excitement. 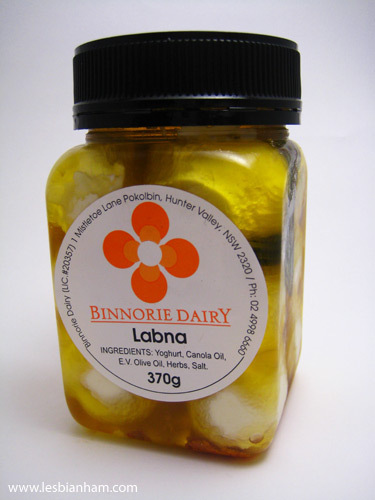 We first came across Binnorie Dairy products on a trip to the Hunter Valley. They have some amazing products – you can find out more about them on their site. Now to figure out how to eat shitloads of cheese without a) becoming a fatty, b) getting stomach pains due to Asian lactose intolerance and c) breaking the bank (I’m fully aware that the answer is NOT to eat shitloads of cheese in one go, but where’s the fun in that?). Hey, just came across this post, by sheer coincidence. And I couldn’t agree more! I buy their Labna almost every week. It is amazing. Cheesy, bur with the marinate ingredients, you get beautiful notes of everything, especially that amazing citrus finish!! Amazing ingredient, I try and use it a lot!